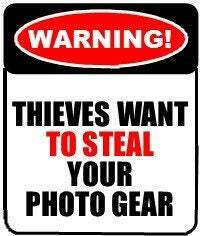 Your camera equipment is valuable to you. Cameras, lenses, bags, filters, and a myriad of other accessories to many to mention. Purchase the Brush Wand and you can identify your precious equipment with just one stroke of the Brush-wand, which is a "pen-like" dispenser with a small brush on the end. The UV-trace adhesive and the unique identifying MicroDOTS are contained inside the body of the unit. A slight twist of the opposite end will deliver MicroDOTS and adhesive to the brush-tip, which can then be applied to an asset for identification or authentication purposes. One dispenser can last up to 120 applications (depending on how often you use it on each item). It is recommended that two spots be selected to put your identification on items. The application takes about 48 hours to completely cure. To remove, the ID will have to be scratched or treated with acid to render it no longer useful. Of course, any scratching or burning in areas of equipment immediately identified a thief. 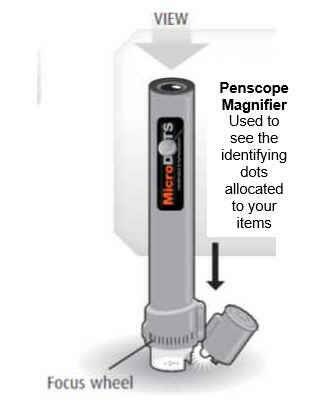 Optional (but recommended) is the Penscope Magnifier which allows you to see that your items have been identified correctly. This little device can be carried in with your gear and used when a mix up of equipment happens. On purchase you will be asked some questions for your name, address, and what you would like to use as a code for your identification purpose. It is recommended that you choose the same ID for every item you wish to identify. 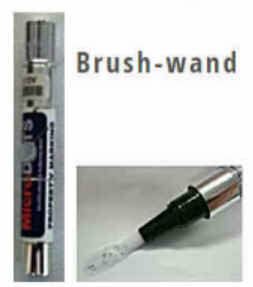 Order your Brush-Wand security today and have peace of mind when going out for that shoot. 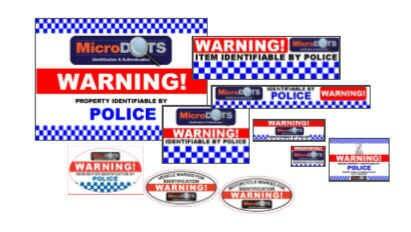 MicroDOT is not limited to camera equipment. It can be used for any item in your home, office or work tools and equipment.